Wicomico Heating & Air Conditioning understands that each business is unique. Every heating and cooling need presents fresh challenges. 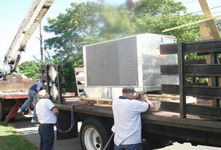 When you call us in Salisbury MD, our certified specialists will factor in all the elements to determine what is the best HVAC unit for your business property. Factors then such as square footage, number of rooms, insulation, windows, climate, local and regional utility costs and allergies will be measured and analyzed to find a system that fits your budget. We have partnered with Trane to offer the most dependable HVAC systems on the market, ensuring the latest technology, quietest operation and unmatched reliability. If you’re also looking for annual HVAC maintenance in the Delmarva area, there’s no better choice than Wicomico Heating & Air Conditioning. We’ll tailor a maintenance plan to meet your exact needs and take the necessary steps to avoid large repair bills and costly downtime. With regular tuning, your equipment will last longer, work more efficiently, operate at an improved comfort level and save you money. Without proper inspection, contaminants build up inside the return ductwork, eventually overcoming your filter and polluting the air you breathe. Call to learn more about commercial HVAC service from Wicomico Heating & Air Conditioning and to schedule an appointment today!